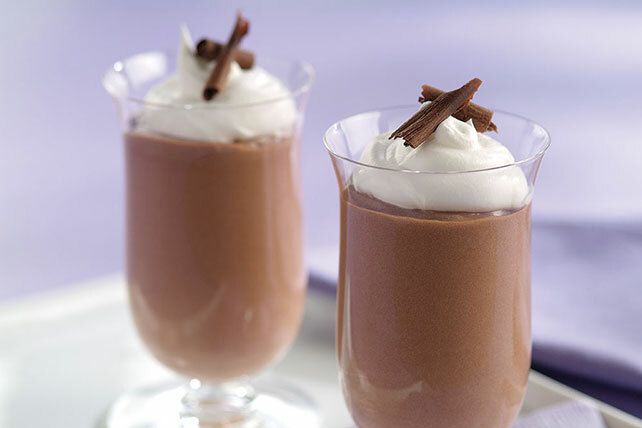 You can make this creamy, deeply chocolatey mousse in just 10 minutes. You will, however, need to wait an hour for it to chill. Beat pudding mix and milk in medium bowl with whisk 2 min. Stir in 1 cup COOL WHIP. Spoon into 6 dessert dishes. Refrigerate 1 hour. Top with remaining COOL WHIP and chocolate curls just before serving. Trim 80 calories and 3.5g of total fat, including 2.5g of sat fat, per serving by omitting the chocolate curl garnish, and preparing the dessert with 1 pkg. (1.4 oz.) JELL-O Fat Free Sugar Free Instant Chocolate Pudding, fat-free milk and COOL WHIP LITE Whipped Topping. Garnish dessert with fresh raspberries and fresh mint instead of the chocolate curl garnish. Prepare dessert in serving bowl instead of the individual dessert dishes.